Yehoshua’s remarks were shocking to many Jewish Americans, but to those familiar with Zionist theory his language and argument were wholly unoriginal ideological boilerplate dating back not only to Theodore Herzl at the turn of the previous century but to the beginning of modern nationalism in the reunification of Italy in the middle of the 19th century. Whether or not the AJC official who issued the invitation to Yehoshua was well versed in the works of Herzl or Giuseppe Mazzini, he or she probably had not read the proposed speaker’s novels, some of which include minor characters who are childless, career focused, Israeli ex-pats. In The Liberated Bride (2001), for example, the overseas childless Israelis are a married couple—the main character’s in-laws—both of whom are international development experts whose work takes them from developing country to developing country across the globe with only brief visits back to Israel. The message conveyed is that Jews who live outside of Israel, including those who grew up in Israel, live Jewishly sterile lives represented literally by the characters’ childlessness. For Yehoshua childlessness is a Jewish issue, as he stated in a recent Jerusalem Post interview, “‘As Jews, post-Holocaust, we have an overriding need to have children, to keep the race going, especially as over one million Jewish children perished in the Holocaust,’ he says. ‘But there are more and more women, and couples, who are deciding not to have a family. It is an interesting issue.’” An additional motivation for Jewish Israelis to have children is to maintain the Jewish state’s Jewish majority, and choosing not to have children might be viewed as shirking a demographic responsibility. 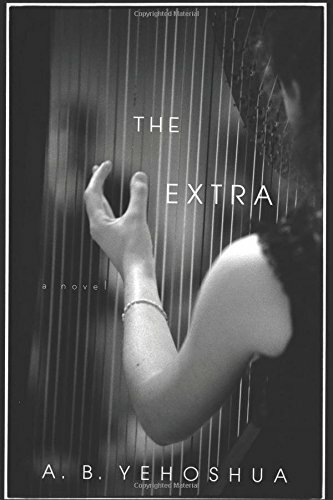 In his new novel, The Extra, the childless ex-pat is the main character. It is a novel of ideas that examines the conflict between individual fulfillment and communal obligation. Making the career focused child-free Israeli expat the central character allows Yehoshua to explore the other side of the ideological argument as well as two of his enthusiasms, classical music and cinema. Prior to the controversy resulting from Yehoshua’s 2006 AJC talk his extra-literary reputation was that of a peace activist and a voice of liberal Zionism. On the surface the new novel is about feminism and the right of women to choose not to bear children. But an underlying theme is whether liberal nationalism is an oxymoron, whether the rights of the individual (the essence of liberalism) can be reconciled with the needs of the nation. Noga (Hebrew for the planet Venus) is a divorced 41-year-old harpist who lives and performs with the local orchestra in Arnhem, the Netherlands, because there were no vacant harpist chairs in the Israeli orchestras. She could have stayed in her native Jerusalem and taught privately and/or at the conservatory while waiting for an orchestra position to open, but when her husband Uriah left her after she told him she didn’t want children, she decides to take the job overseas. At the time her father respects and supports her decision not to have children, and out of respect for him her mother keeps her own counsel. Six months before the start of the novel Noga’s father dies leaving her mother alone in their apartment in an increasingly insular Orthodox Jerusalem neighborhood in which she is the last remaining secular resident. Noga’s younger brother Honi, who lives in Tel-Aviv with his wife and children, suggests his mother move to a studio apartment in an assisted living facility in Tel-Aviv so that he and her grandchildren can visit her more easily and so that she won’t be socially isolated in her changing Jerusalem neighborhood. Their mother agrees to a three-month trial residency in the Tel-Aviv apartment after which she can either stay permanently or return to Jerusalem. Noga agrees to take a leave of absence from her orchestra and house-sit the rent-regulated Jerusalem apartment to prevent the landlord from leasing it to new tenants at a market rate rent, thus putting herself, a child-free by choice single secular adult woman, amid Orthodox neighbor families with many children, two of whom habitually break into the apartment to watch television, a forbidden activity in their own home. Noga is both fond of the boys, the sons of her childhood friend and neighbor Shraga, and resentful of their invasion of her privacy to the point of bolting the door and window and buying a camel whip from a Bedouin in the old city. One of the boys appears to have ADHD, and television is the only thing that calms him and focuses his attention. If Yehoshua is using this novel to pose a counter-argument to his ideological view of Jewish life in and outside of Israel, then the insular Orthodox, who have at best a tenuous allegiance to the Jewish state, would no doubt argue that they lead more authentic Jewish lives than do Yehoshua’s fellow secular Israelis. But both insular non-Zionist Orthodoxy and Yehoshua’s secular nationalism emphasize group identity over individualism, a position at odds with an increasingly global and individualist digital culture. In this context two migrations epitomize the decline of Israeli liberalism: secular Jerusalemites leaving an increasingly Orthodox city, and liberal Israelis fleeing an increasingly strident and intolerant nationalism to new homes in the diaspora. The house-sitting assignment also keeps Noga, who living abroad has even fewer opportunities to spend time with her mother than her brother and his kids, apart from her mother. Honi, who heads a film and television production company, finds Noga work as an extra on the sets of movies, commercials, and live performances to provide her with spending money and a way of occupying her time. Readers must suspend disbelief and accept that a professional musician would agree to spend three months without access to an instrument on which to practice, and that in lieu of practicing she would have free time she needs to fill. In the second half of the novel we learn that Noga’s childhood student harp is still in her mother’s apartment, but with rotted wood and missing strings it is unplayable. When Noga will next not only practice but perform is also an open question. Her job is secure, but not all orchestral works have parts for harp, and her phone calls and email exchanges with her fellow orchestra members include discussions of upcoming repertoire. Yehoshua, who was 83–85 when writing The Extra, appears to be comfortable with email, but oddly there are no text messages, not even for brief missives. One of Noga’s roles as an extra is the part of a peasant woman leading a donkey pulling a cart of children across the stage in an outdoor performance of Bizet’s Carmen at the foot of Masada on the shore of the Dead Sea. Uriah is in the audience, and seeing his ex-wife for the first time in years he becomes obsessed with her despite having remarried and having children. Thereafter Uriah goes to ridiculous lengths to stalk Noga, and this review will not reveal what transpires when the former spouses finally meet and talk. Suffice to say that her ex- and her mother have still not accepted Noga’s decision to not become pregnant as final, but she has moved on, is content with her life, is eager to rejoin her orchestra and resume the work she loves. Noga’s mother accuses her of being a narcissist who views other people as extras, but it can also be argued that Israeli society views child-free adults as silent extras peripheral to the national drama. Though she would have preferred to play with an Israeli orchestra, Noga feels lucky to have landed in a place where people respect her life choices and make no claims on her uterus. Stuart Schoffman’s rendition of Yehoshua’s Hebrew prose is a delight, and Noga is a compelling contemporary heroine. Four and a half decades after his first book’s publication his 20th shows Yehoshua’s writing chops are undiminished and his content fearlessly topical.